Throughout his career, Jim Rielly received numerous letters of recognition from celebrities and dignitaries. We came across this announcement in the archives of the Bristol Phoenix. From the April 27, 1972 issue of the Bristol Phoenix. 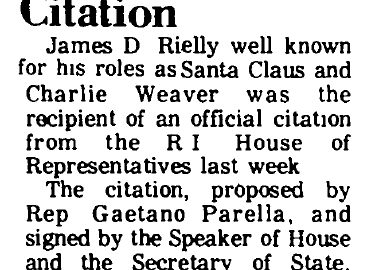 James D. Rielly well known for his roles as Santa Claus and Charlie Weaver was the recipient of an official citation from the Rhode Island House of Representatives last week. The citation, proposed by Rep Gaetano Parella, and signed by the Speaker of House and the Secretary of State, offers sincere congratulations to Mr. Rielly and is awarded “in recognition of his bringing joy and laughter to the sick, retarded and elderly. ← What is the meaning behind the James D. Rielly Foundation logo?